Some friends of mine live in a mobile home park that is owned by the resident owners as a co-op. This could be a solution to affordable home ownership since even condominiums in the Bellingham area are usually well over $100,000. Buying a share in their mobile home park only costs $17,500. That's almost like owning the land under your home, but not quite. It's a share in the cooperatively owned park which allows one a space for their home, access to the central clubhouse and other benefits. Each month members pay dues as well, but the dues are around $160 per month. That's quite reasonable compared to rent in most mobile home parks, let alone renting an apartment. The dues cover ongoing expenses such as water and sewer as well each resident's share of the property taxes that the park pays on all the land. One also buys their mobile home unit which can be as low as $15,000. Most of the mobile homes are more than $15,000, but $25,000 - $60,000 is a likely range. When one thinks about it, this is an affordable way to have home ownership, if ownership is desired. For instance, a mobile home for around $20,000 plus the park "buy in" share for $17,500 means buying a house for $37,500. For Bellingham, that's not bad. Another affordable housing option in the Bellingham area is an organization called Kulshan Community Land Trust. They have some partial ownership schemes also, but I've noticed that the cheapest condominium, currently in their listing, is around $116,000! That's Bellingham for you. They also work with owners who are buying houses, but these are usually even more expensive, tho I saw a house listed in their office window for $104,000. Looks like mobile homes are less expensive, but Kulshan doesn't deal with those kind of properties. Mostly, I hear, because financing institutions basically overlook the mobile home option. With lack of affordable housing such a big problem, I think mobile homes need to be taken more seriously. Problem is, urban zoning doesn't usually allow them. The park that my friends live in is near the city limits. It's still on the bus line tho. Mobile home parks aren't as dense as condominiums and density is good for environmental reasons, but they do tend to be denser than single family zones. Pictured: One of my friend's neighbors has raised beds for gardening. The park that my friends live in is quite nice with a small lake in the center, quite a bit of space between the units and a nice clubhouse. Speaking of clubhouse, that brings up the topic of "community." People I know, that live in mobile home parks, seem to have lots of community. Talking to folks around the mailboxes, going to "Meet your neighbor" meals at the clubhouse and so forth. My friends, who live in that park, think about it in terms of "intentional communities." 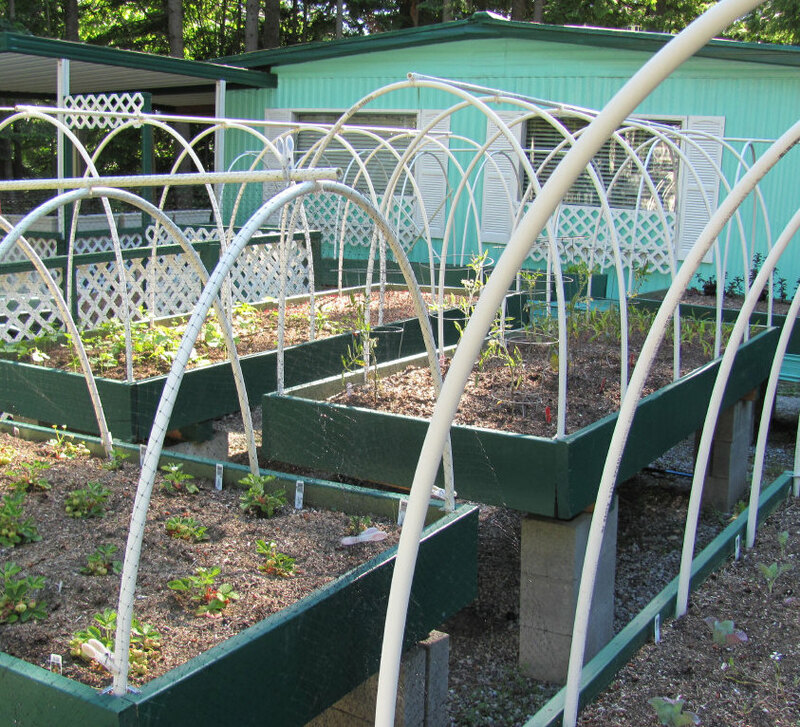 They have interest in things like home gardening and sustainable communities. Mobile homes might be a good way to bring this about that is not super expensive. But they are a good form of housing for mobile American society. Average American moves every 5 1/2 years? (maybe even more). We're nomadic. Maybe our houses need to move with us; like American Indian teepees. It's better than commuting, for instance if one owns a house in Everett, works for Boeing in Everett and then gets transferred down to the Renton Boeing facility. Also mobile homes might do well for answering the question, "should New Orleans be rebuilt?" Make it mobile. Let it move around with the shifting wetlands. Put it where the changing river and coastline wants it, rather than locking it into one spot. Flexibility. Mobiles might adapt better to floating also. A while back, I heard, on the Clark Howard Show (a radio financial affairs counsellor), a suggestion of making New Orleans homes float. This might solve much of the flooding problems. Radio said they do this in much of Holland. When the 50 year flood comes, the houses just float. Minimizes the damage.